Friday nights have not been the same lately due to my knee injury. Not only do I miss playing hockey with my team, I don't get to eat out afterwards! However, Gadget Girl wanted the whole gang together after the last game before the Christmas break for dinner. She suggested I come out despite not being able to play. Now that works for me! No hockey, yet still get to eat. Since location was of prime importance (everyone lives in a different area in the GVRD), we ended up going to Osaka Sushi in North Burnaby. Located in the former location of Yummy Yummy Sushi, this was as central of a location we could decide on. With s ome subtle tweaks in the decor and the addition of booth seating, the place has gone somewhat more upscale. Yet, the menu prices seemed quite reasonable at the same time. Because we had a group of 18, we pretty much took over the whole restaurant (the place is not very big). Making a cameo appearance was Polka King, who was able to escape the grip of marriage to join us for dinner. 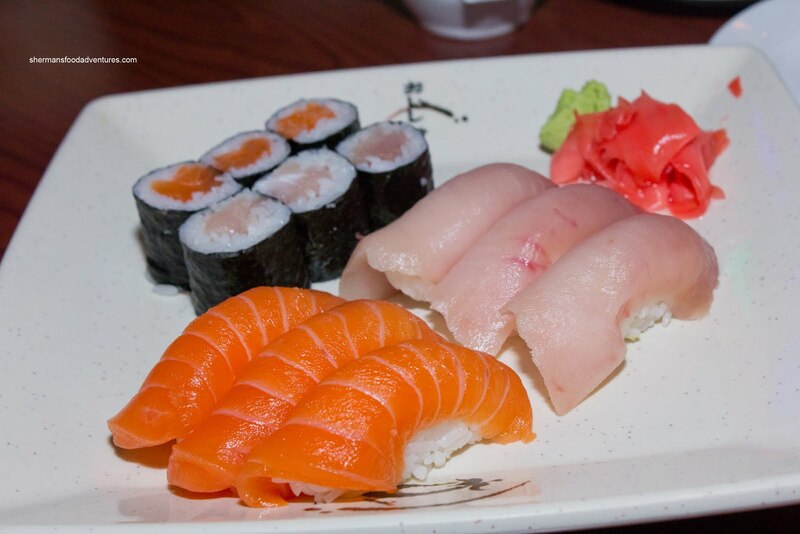 He ended up with a Salmon Tuna Sushi Combo that included maki and nigiri. I was able to try one piece of the tuna nigiri and I have to say it was pretty good. The rice had a good chewy texture and some hint of sweetness while the tuna on top was fresh and soft in a good way. 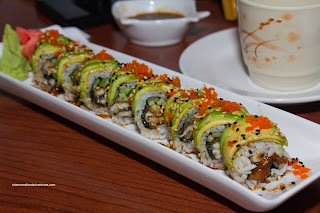 He also had the Dragon Eel Roll and it was very reasonably-priced at $6.95. 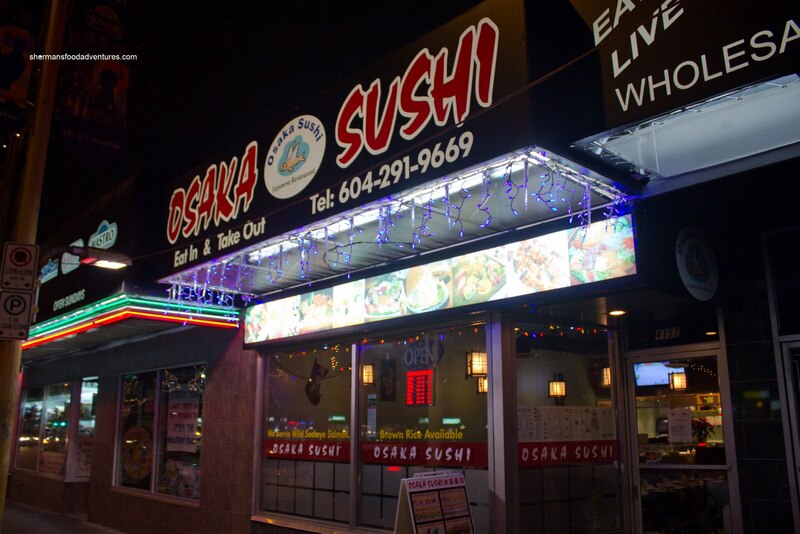 Normally, specialty rolls run in the neighbourhood of $10.00+. He was pretty happy with it. 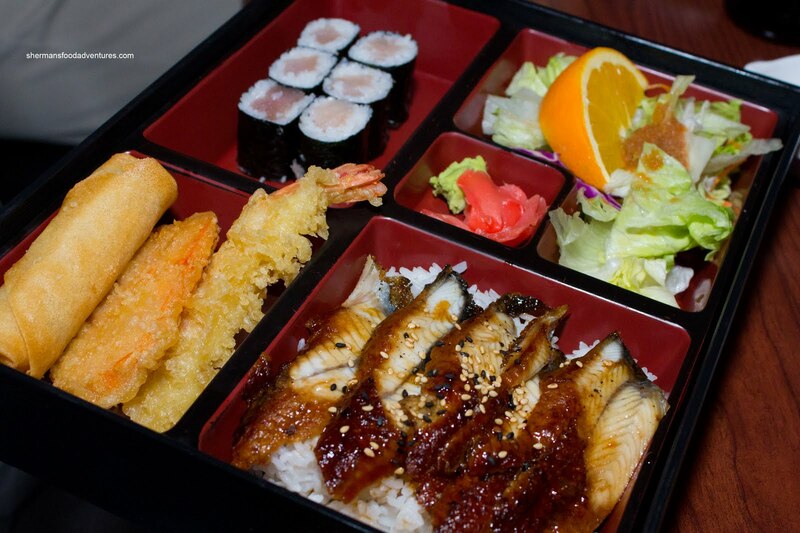 Mr. Blueberry decided on Combo 10 (yes, there are a lot of combos here) which included a small Unagi Don. This was the star of the box with chewy rice and an abundance of unagi. He liked it so much, he ordered a 2nd box! Gordo decided to share the Sushi Boat for 2 with Emilicious, however, he got a few single items for himself including an Ebi Sunomono. 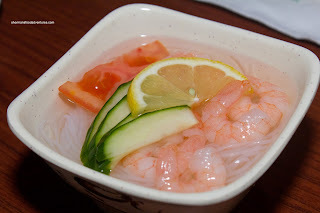 As you can clearly see in the picture, this was not a crappy sunomono you'd find at most other Japanese restaurants. Large cold water ebi lay atop chewy noodles in a balanced dressing. 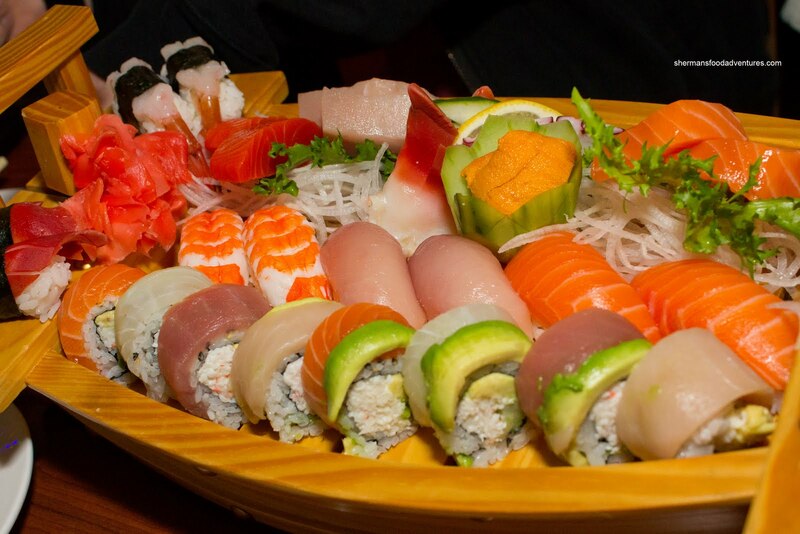 The Sushi Boat for 2 was pretty impressive when it arrived. It was visually appealing and the items were fresh including the uni. Emilicious and Gordo were pleased with their order. I tried one piece of the Rainbow Roll and Uni. I would have to agree that the food was well-made. 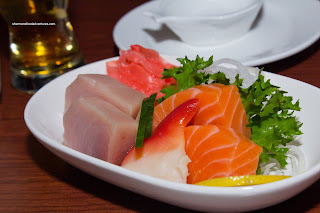 For myself, I ordered 3 things starting with the Appetizer Sashimi. When it arrived, we were impressed with the size of the slices. Furthermore, the salmon had a nice texture and tasted quite sweet. As mentioned, the tuna was fresh. For my main, I opted for the Tonkatsu served on top of rice with a side of green salad. This was a really large pork chop which literally covered all of the rice. Look, you can't see the rice! Moreover, it was fried perfectly crisp and was not greasy at all. What I liked best was the meat itself. It was moist and tenderized enough that it was easy to chew while not losing any meat texture. 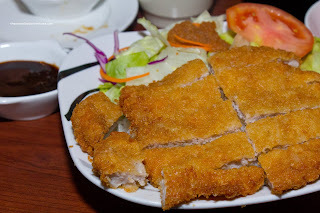 The tonkatsu sauce served on the side was thick and flavourful (probably the jarred stuff, which is fine by me). 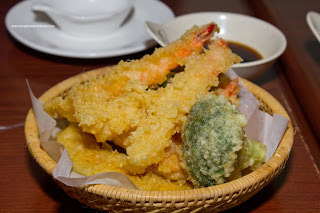 Lastly, I had the Assorted Tempura which consisted of ebi, yam, squash, carrot, broccoli and an imitation crab stick. 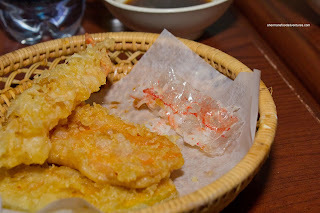 Although it was fairly dark in colour, the tempura was crisp and not too oily. The veggies and shrimp were cooked properly with nothing overdone nor soggy. However, when I got to the crab stick, this is where it all went wrong. One bite and... hey, why is it so hard to chew? Is there a seaweed wrap around this? Wait. No. Can it be? They friggin' forgot to remove the plastic wrap around the crab stick! They fried the damn thing in its plastic!!! So I pondered for a moment. Honestly, I'm not the type to make a big fuss in a restaurant. Typically, I like to eat and then leave as discreetly as possible. Yet, I really needed to let them know on this one. I waved a waitress down and showed her the large piece of plastic. She apologized and then took off. Uh... Then, another waitress comes by and asks how was our food. Emilicious took it upon herself to indicate that there was plastic in my food. She also apologizes and asks if I want something else. I really didn't want something else since I practically finished my tempura already. In my mind, what I really wanted was for the tempura to be taken off the bill. Guess what? It wasn't. When I was up paying my bill, I showed my displeasure and they still didn't clue in. Whatever, I left it at that. It's really too bad about the plastic and the non-response by the staff. Overall, the food was actually pretty decent and reasonably-priced. If we don't look at the plastic incident for a moment, the staff was actually very friendly and did their best to accommodate us (especially for such a big group). The food came out in a relatively expeditious manner and everyone was pretty much satisfied. I realize that nothing can be perfect and in fact, with such large group, I thought that the restaurant did a very good job. So the "plastic" incident was the only real blemish. To be fair, the staff did apologize. However, by not taking it off the bill was not acceptable. I don't really care about the $6.95, it is all about the principle. Whoever made the tempura was not careful with the prep and fried a crabstick still in its plastic. It is akin to making a grilled cheese without removing the cheese from its wrap. Not good. Either they train their staff better to deal with such situations or have a policy in place. Osaka is a smaller operation, so it is pretty obvious they do not have any protocol in place. In the end, it was all about bad luck. It was bad luck that I got the plastic and that it ever happened at all. If the plastic thing never happened, I would be singing the praises of an above-average Japanese restaurant in North Burnaby. Yet, what happened - happened. It left a bad taste in my mouth literally and figuratively.